Squash House Quilts: Beach Anyone? I wouldn’t be surprised if the majority of you reading this, well - except maybe Terri, who is already there, would jump up from what they’re doing and follow me there in an instant! Snow, ice, rain, cold - do I hear “We’ve had enough”?? So here is the next best thing - to me, anyway! 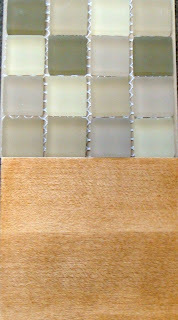 The sample of the tile backsplash for the Squash House arrived yesterday. I managed to find a supplier online who carries it for half the price of buying it in a showroom! Isn’t the Internet wonderful? It’s called Beachside Raffia and is a frosted beach glass. I think the grout will probably be a neutral, sandy color. And It coordinates really well with the lights I chose. Here it is up against the butcher block sample! 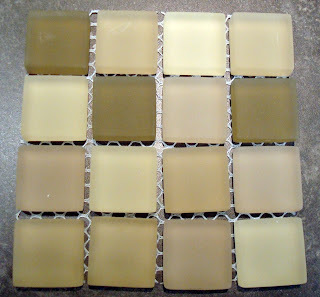 The tile sample below is sitting on top of a gray colored cardboard, so you have to just imagine sandy grout! The colors you see in the first picture are the best representation of the actual color. Has anyone else who subscribed to ME’s Home Companion received a note indicating that we will receive Martha Stewart Living for the remainder of our subscription? I did hear the sad news that Home Companion would no longer be published, but I wonder how they decided I should receive Martha? I used to subscribe to Martha, but I finally let my subscription run out because she got just too “fancy” for me. I found I loved looking at the pictures, but there was no way any part of our life would look like most of them! And besides, I preferred spending my money on quilting supplies! I feel the warmth of the beach already. Gorgeous tiles!!! have not heard from my ME people at all! Kind of bugs me. I'd happy with Martha. I go to Karen's blog when I need to see/feel/smell the beach. Wow, that beach glass is just gorgeous!!! SCORE! for finding it at such a bargain price! love the tiles! pretty presumptuous of martha, don't you think. i agree...her magazine is too uppity for me. i can't even find the ingredients in most of her recipes. ooooww, that is going to look great!!! Love that tile backsplash. You can pretend you are at the beach all the time. I no longer subscribe to ME but one of my other subscriptions Romantic Homes I think it was, I was notified that it would be finished out with Sunset magazine I believe..A sign of the times?? I think I might want to hire you to come and redecorate my home. You have lovely taste.. Okay, first you tease us with dogwoods, then you invite us to the beach... what are you doing? I'm counting the days until this snow leaves and the flowers really do bloom. The tiles you've chosen are beautiful. I guess you'll be able to have the beach all year round! My word, I LOVE those tiles, ABSOLUTELY!! They're so warm and wonderful. I also could see a warm, wonderfully soft quilt made from these colors. Love the tile for the backsplash! I like that it's frosted as well too! I love getting a good bargain...makes it all the sweeter, doesn't it?